Through the end of October, buy a bag or pannier, fill your new bag with any new parts and accessories, and we will give you 25% off everything inside the bag. Also, pro tip, you can put a bag inside a bag, which means you can buy one bag at full price and get the second at 25% off. Besides the typical selection of bags (Blaq, Black Star, Axiom, Ortleib, Jandd), starting in October we will be carrying the new Route 7 panniers from North St. We’re excited about this new pannier. It’s more versatile, with reflective striping on both sides of the bag. 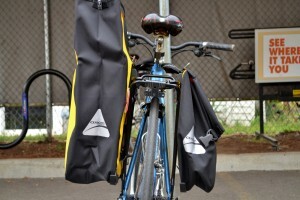 There are external pockets for keys or a phone, and a new system for attaching the bag to your bike. We’re proud to be the number 1 dealer of North St. bags in town.